Jefferson Greene among cohort of artists in Caldera's Artist in Residence Program, near Sisters. Each winter, the Caldera's Artists in Residence Program, near Sisters, welcomes creative individuals and collaborations to spend up to a month in the Cascade foothills to focus on their creative practice, work with young people from Caldera's Youth Program, and connect with Central Oregonians through art and conversation at monthly Open Studios. The first cohort of artists, including Jefferson Greene, of Warm Springs, arrived on Jan. 4, and have settled into life at the Caldera Arts Center. The artists, who come from as far as New York City, are working on a wide variety of projects including novels, screenplays, performance art, video, illustration, and sculpture. Their projects and others will be shared at the first Open Studios on Jan. 26. "Open Studios provides an opportunity for our Artists in Residence to share their works in progress with the Central Oregon community. Often, Open Studios is the first time these works are seen by the public. It's a special opportunity to experience works of art in the middle of the creative process and hear about that process from the artists," said Maesie Speer, Caldera's Arts Center program director. "At Open Studios, even though there are presentations, the audience doesn't sit and watch the whole time," said Speer. "We are up and moving through the Arts Center and even outside. We encourage the artists to get creative with how and where they show their work. There's also time to wander, have some refreshments, and discuss with friends." Doors to the Arts Center (31500 Blue Lake Dr., Sisters) will open to the public for Caldera's Artists in Residence Open Studios on Jan. 26, Feb. 23, and March 23 from 12:30-3:30 p.m (program beings at 1 pm). Artists in Residence, as well as Caldera students, share their work with the public through presentations and performances. Admission is free and light refreshments will be served. For more information about each Caldera's Artists in Residence program, visit in the Artists in Residence section of Caldera's website www.calderaarts.org. 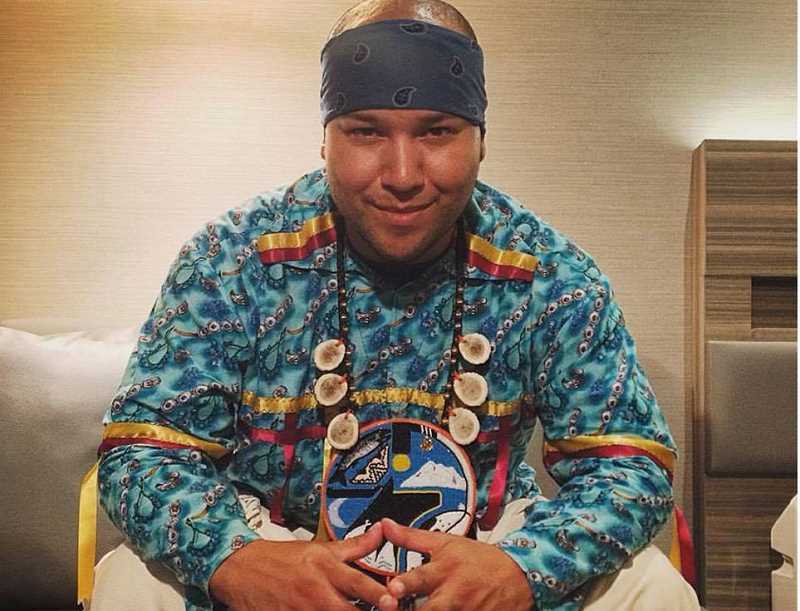 Born and raised on the Warm Springs Reservation, Jefferson Greene has been groomed to share much of his life experiences, learnings, understandings, and adventures with communities throughout the northwest region. Art has been an avenue for Greene to express himself to his audiences. After completing his bachelor of science degree in three disciplines —management, marketing, and advertising — Greene began serving the people and Confederated Tribes of Warm Springs, coordinating community projects, writing grants, producing arts and entertainment, and being a public educator on Columbia Plateau history and customs. More recently, his interests have centered on language preservation in the Columbia Plateau, where he apprentices under several first-language Ichishkíin speakers from Warm Springs, Yakama, and Umatilla. Other artists include Anthony Hudson, of Portland, a multidisciplinary artist, writer, performer, and filmmaker, who is perhaps best known as Portland's premier drag clown Carla Rossi; Farooq Ahmed, of Los Angeles, California, a graduate of the Columbia University Creative Writing Program and of Brown University, where he studied biochemistry; and Maria Alejandra Barrios, of New York City, a writer born in Barranquilla, Colombia, who has lived in Bogotá and Manchester, where she completed a master's degree in creative writing from the University of Manchester. Rounding out the cohort are May Cat, of Portland, who grew up in Chicago, a multidisciplinary artist who immerses herself in various mediums, inspired by her Thai-American roots; Andres Chang, of Brooklyn, New York, an artist who employs numerical computation, drawing, construction, sound design, and performance to produce work from a uniquely interdisciplinary perspective; and Anna Gray and Ryan Wilson Paulsen, of Portland, who work together as one artistic entity in and around the activities of reading, writing, and translation. Caldera is a catalyst for the transformation of underserved youths through innovative, year-round art and environmental programs. Caldera serves Oregon youths from both urban and rural communities, with limited access to educational and economic resource opportunities. Caldera's programs nurture individual creativity to ignite self-expression and transform the way young people engage in their lives, families, and communities. In 2015, Caldera received a National Arts and Humanities Youth Program Award from First Lady Michelle Obama, recognizing Caldera as one of the top youth arts programs in the nation.